The discrepancy is much due to lower returns on capital that, considering capital-labour substitution, lead firms to invest in augmenting labour. 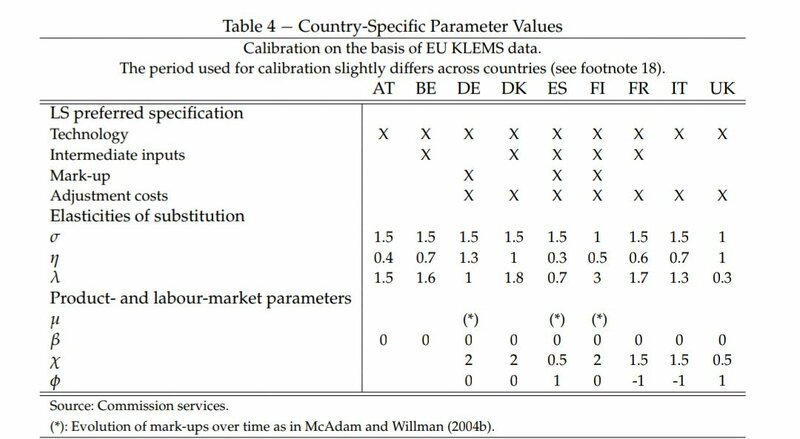 The ECB estimates unskilled labour and capital (sigma, the top row of the three elasticities of substitution) are substitutes whereas capital and skilled labour (eta, the second row) are complementary. It also estimates labour wages are more sensitive on some Member-States than in others to an increase in intermediate inputs (lambda, the third row). Notice elasticities are computed by weighing the capital-labour ratio by the ratio of wages to capital returns. As the decline in returns to capital begun in 2007 has accentuated since, wages remain the main driving force of substitutability that can only be overturned by higher capital investment. Policy has sought to increase capital investment and/or improve human capital as higher interest rates shall more quickly erode the value of labour-augmenting technologies than that of capital-augmenting technologies considering the increasing volumes of capital in comparison with limited labour supply. The dash towards complementarity is a legitimate policy objective as both labour and capital increase in tandem when complementary – yet it is very hard to attain as long as real interest rates paid on loans (considering stable depreciation) remain above returns on capital. The elasticity of substitution may increase towards complementarity if labour costs keep a stable growth path or diminish relative to returns on capital. Considering elasticities of substitution above unit, the effort to embed skills achieves that goal by lowering the (record high) labour share observed in 2018. The reduction is compounded by higher capital investment. At the current juncture, the gap between value of both technologies has widened such that likely labour costs must exhibit some restrain. Governments can achieve the effect without losing fiscal revenues by shifting taxation from labour to consumption, furthermore relevant as the multiplier for the increase in labour share as a result of an increase in intermediate consumption is far higher than that of higher labour costs. 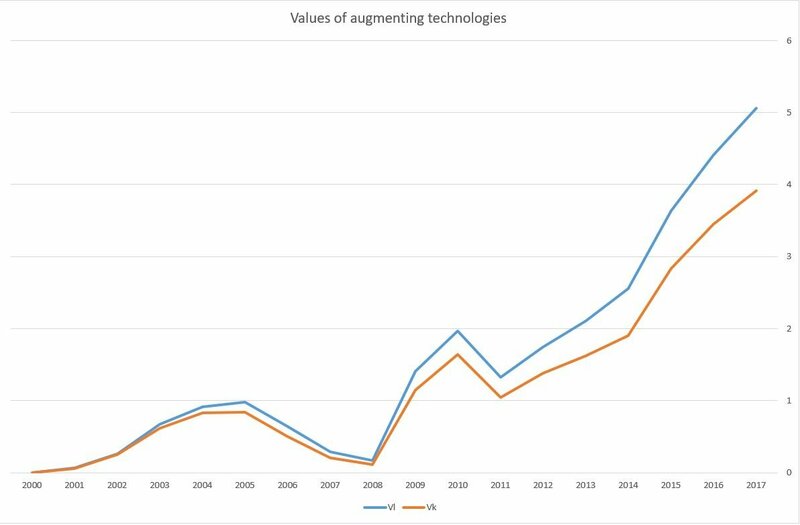 Another path is accelerating the depreciation of existing technologies that, considering the persistent substitutability of the past decade, are bound to asymmetrically reduce labour more than capital. Higher fiscal or regulatory depreciation of labour-augmenting technologies should not hamper innovation. A policy challenge remains as stimulating depreciation would significantly impact labour and lower the labour share in the short-term. Governments don’t have the fiscal space to engage in such policies, nor are fiscal frameworks geared towards indirect taxation. In that, the loss of revenues resulting from faster depreciation and lower revenues from taxing labour is unpalatable. In conclusion, Governments may overturn the perilous path towards automation while preventing grassing inequality (that would result from a disproportionate increase in skilled labour while substitutability is significant) by restructuring fiscal frameworks and increasing depreciation of labour-augmenting technologies now, while real loan interest rates are relatively low. When rates begin increasing, labour’s natural volume disadvantage should propel more violent and sudden capital accumulation – that shall entail the aforementioned substitution, unemployment and inequality much feared in most policy circles. Next Article Could tariffs on steel cause inflation?